Sometimes it's good to try new things. As a seamstress, I generally prefer to sew my own clothes. They fit better than off the rack. Plus I can really customize my pieces. But when eShakti contacted me to see if I'd be interested in reviewing something from their site, I said yes. This great embroidered skirt jumped out at me as too cute to pass up! 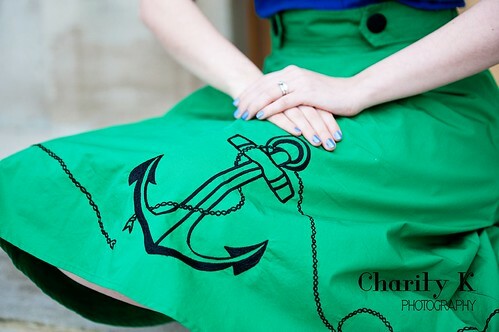 Especially since my summer sewing theme is non-traditional nautical. Generally, I have to stick to purchasing very full skirts online since I have large hips. One of the great things about eShakti is that they do custom sizing so I was able to know that this skirt would fit my waist and my hips. I just adore my new skirt but they did excellent in the customer service department too. My emails were answered quickly and the shipping was super fast! In fact, my skirt arrived before they sent the email letting me know it had shipped. 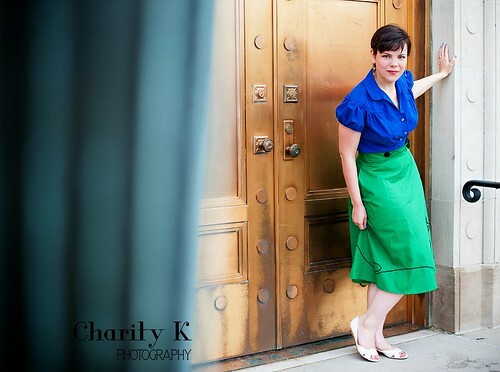 Looking for more eShakti goodness? Find them on Facebook, Pinterest and Twitter. 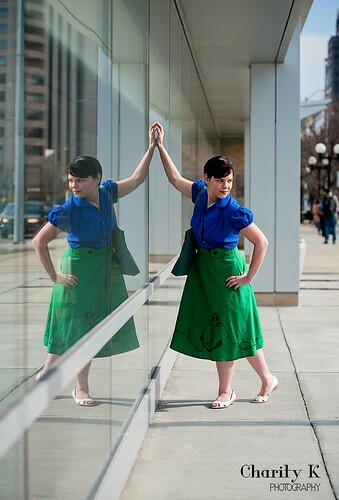 To style this skirt, I made up a blouse in dotted Swiss from Butterick 7641. I couldn't find any nautical buttons I liked so I went with flowers instead. 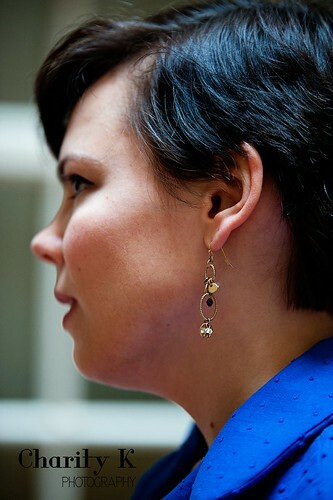 I went pretty light with the jewelry and just stuck to these nautical earrings. I also tried something else new for this post. As you all know, my husband is a professional photographer and most of my blog photos are by him or done with a tripod and a remote. 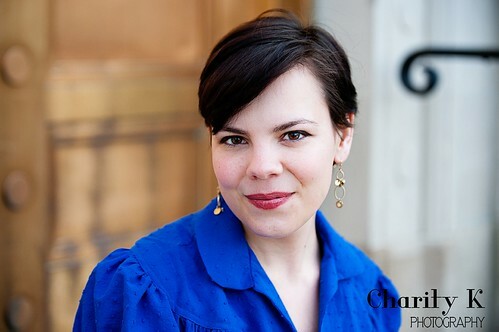 But these photos are by my friend Charity of Charity K Photography. She and I had an amazing photoshoot downtown. It's easy to get stuck in a rut with photos for blogs. The same poses in the same locations. It was so nice to spice things up and work with someone new. We had so much fun finding cool locations and trying out new poses together. Charity is a great photographer and it was quite inspiring to work with her. We were able to be so creative together and these gorgeous photos are the result! Maybe it's time for some new things in your life! 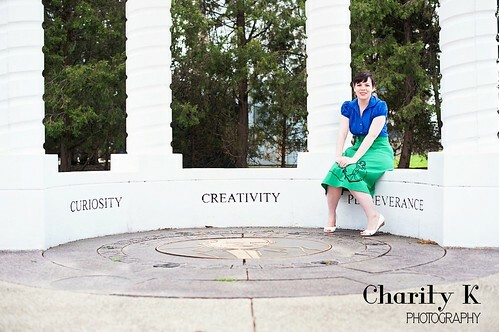 I can see more eShakti and Charity K Photography in my future! 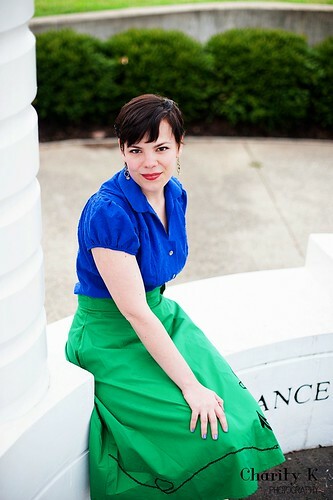 Disclosure: The skirt was sent to me by eShakti.com for free in return for a review. All opinions are my own. 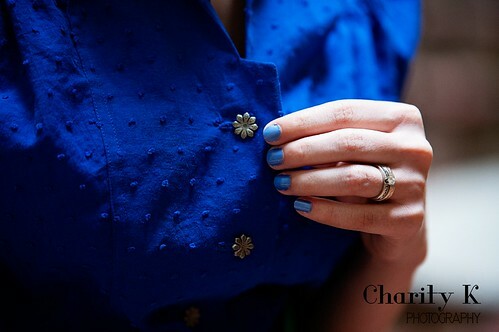 What a cute skirt and the color and style of the blouse you made goes perfectly with it. As someone who is naturally pear-shaped, it's great to know of a company that will make things to my measurements so it fits at the waist and hips. You are so blessed to have such great photography for your blog. I always enjoy the quality and artistic view of your pictures, but it was definitely nice to see a different point of view and scenery for this post. Amazing blog post as always, you make me want to go vintage. I just need to learn how to sew more than a hem now. 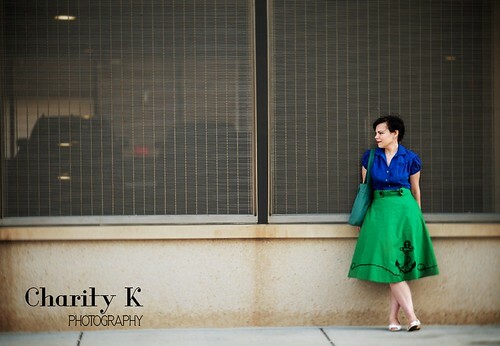 Or maybe I will just go to eshakti.com for a fab skirt with pockets. =) PS. Thank you for the shout out. It was so much fun to work with you on this project. I cant wait for what's next to document with my favorite urban couple! Also, the pictures are lovely! Gorgeous photos!!! That skirt is really, really charming! 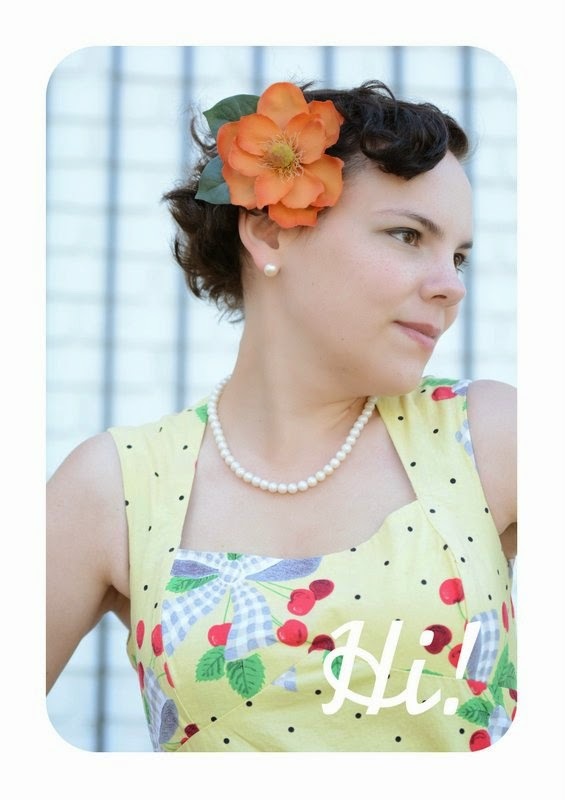 I've had really mixed experiences with eShakti over the years (and blogged about some of them), so it's always awesome when I see a fellow vintage blogger/online friend love the item(s) they receive from this company. 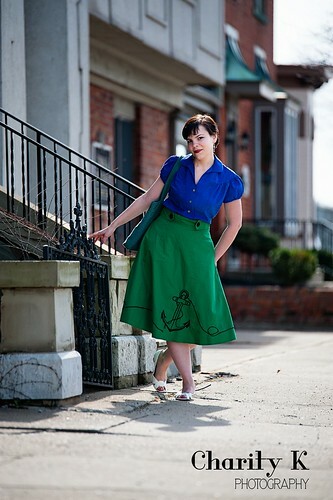 The skirt is cute, but the photos are awesome! And I love your blouse, too! Great outfit, the skirt is adorable and one of my favorite colors for spring. They (blouse and skirt) look so beautiful with your coloring. I kept looking in the background to see if those were places I know from town! You look beautiful! 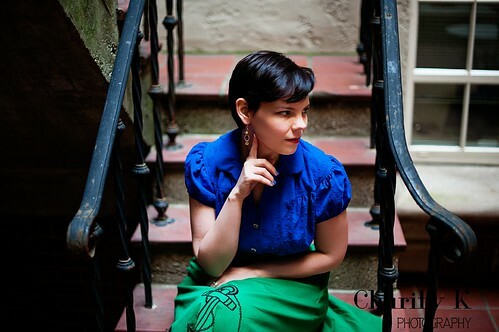 I have been thinking about having another woman photograph me,too. 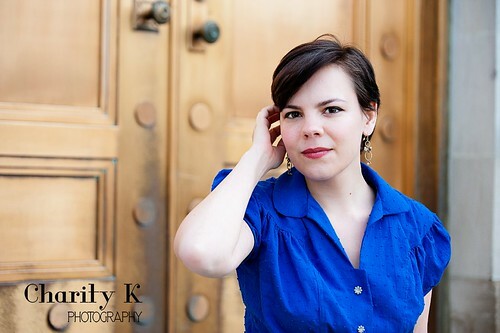 My husband is an amazing photographer, but I a different set of eyes might be able to better understand how a girl wants to look in pictures. The close up of your face is my favorite. 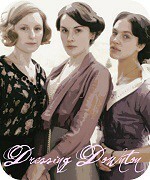 Oh this is darling! 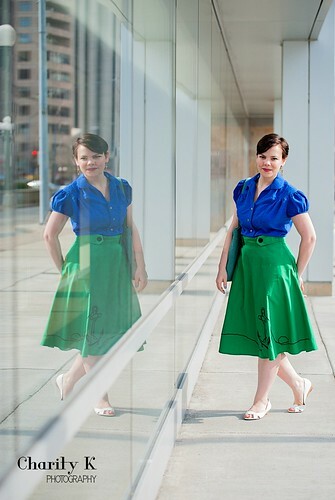 I've worked with eShakti a few times before and am often happy with the items I've received. I understand your point of view regarding making your own clothes vs buying new. I'm leaning that way more with costumes. I still have constant battles sewing clothing for myself!